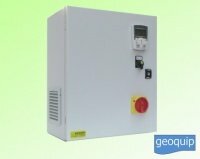 Control panels, inverter, alarms or variable speed drives, starter panels for single phase and three phase pumps or motors and systems. Incorporating the latest technology, the range features dry run protection, constant pressure inverters, soft start and variable speed drives, remote control capability direct on line, star delta and other custom special applications. Energy efficient applications. We specialise in bespoke and custom built control panels that meet specific needs for domestic, industrial and specialist applications. Full technical support is offered at all levels. ​Direct On Line start is probably the simplest and traditional type of start and it is to connect the motor directly to the power supply performing therefore a full-voltage start-up. A soft starter for the start of the pumps consists basically of two parts: a power unit and a control unit. A frequency converter is an electronic device used to control the rotation speed and torque of an electric motor. The motor, in its turn, operates a load (such as a pump). A frequency inverter converts AC voltage of the mains in DC through a rectifier and a bench of capacitors of the middle circuit stabilizes it. Anti Blackout back-up sump pump systems, HELP panels are anti black-out systems for single-phase loads. They are mainly used to control and supply sump pumps in black-out conditions. 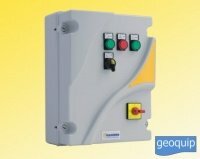 Various monitoring and alarm panels for use independently or in association with our range of control panels. Full monitored Web telemetry solutions available. A range of constant pressure inverters, pre-programmed and ready for use on many constant pressure pumping systems. Single phase 230v, Three phase 230v and 400v. From 1.1kW to 30kW. 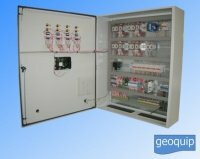 Custom built panels with PLC control, remote monitoring for many industries - construction, building maintenance, geothermal, rail infrastructure. Direct on line, star delta starter, reactance and soft start electromechanical starter panels. 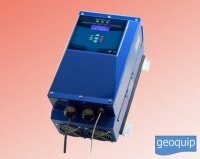 0.18kW to 110kW (and beyond), for single or multiple pump installations. High efficiency control panels fitted with frequency inverters and variable speed drives in standard configurations or constant pressure pre-programmed systems. 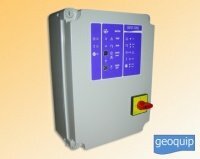 1.1kW to 110kW (and beyond), for single or multiple pumps. A range of electronic direct on line starter panels designed to cover a range of motor sizes within the same unit. 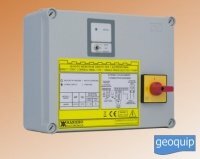 Low voltage inputs for floats, level probes or other switches. Single and Three phase - motor sizes from 0.37kW to 16kW.